Tempted to try your hand at blackwork but just can’t decide which pattern you love the most? The Blackwork of the Heart pattern set includes all three patterns in the Blackwork of the Heart collection — Converging Love, Mosaic Tile, and Blackwork Love. 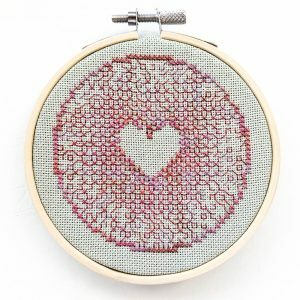 All three of these pretty patterns make perfect gifts as they are quick to stitch up, they’re only 3″ in diameter if stitched on 14 count fabric. Their size also makes them perfect for blackwork beginners. 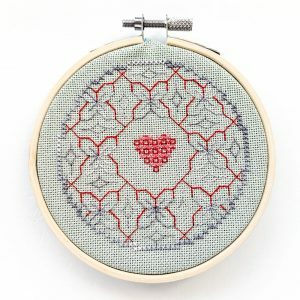 Using a variety of Sulky® solid and variegated (Blendables®) thread in two weights, stitchers can create lovely blackwork projects for their home or a loved one. Enjoy this traditional technique with a modern flair with the Blackwork of the Heart pattern set. Models stitched over two on Zweigart 25 count Lugana 101 (Antique White) fabric and on Zweigart 25 count Lugana 618 (Moss Celadon) fabric. 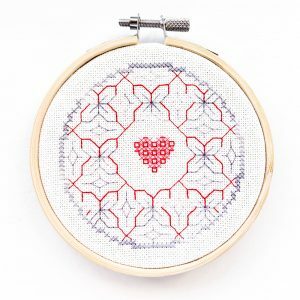 Stitch up a beautiful blackwork heart with the Converging Love blackwork pattern. There are many paths to love, and this blackwork pattern symbolizes that love comes from many directions and many sources. 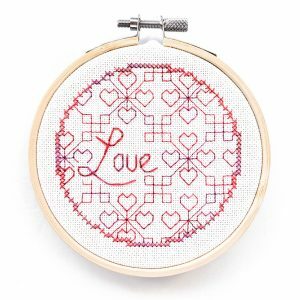 This pretty pattern features one colour of Sulky Blendables® cotton thread in two thread weights, creating the effect of the heart design intensifying at the centre. It’s also small enough to be stitched multiple times as gifts for those you love. This pattern is also available in a set, the Blackwork of the Heart pattern set. Need a little gift to show your loved ones you care? Or maybe you just want to try your hand at blackwork but don’t want to dive headfirst into a difficult and complex pattern. The gorgeous little Mosaic Tile blackwork pattern is ideal for blackwork beginners. This pattern features three lovely colours of Sulky® cotton threads, in both solid colours and a gorgeous variegated Blendables® colour. Whether it is a gift for Valentine’s Day or to inspire you at home, the pretty Mosaic Tile blackwork pattern is sure to bring joy every day. This pattern is also available in a set, the Blackwork of the Heart pattern set. 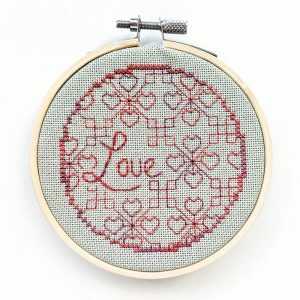 Stitch a little project to show your loved ones you care with the Blackwork Love blackwork pattern. Featuring two weights of cotton Sulky Blendables® thread, this pretty pattern is the perfect way to play with blackwork on a small scale. 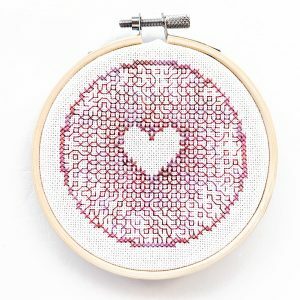 Even if you’re a complete novice to blackwork, if you can do backstitch you can do this lovely little blackwork pattern. 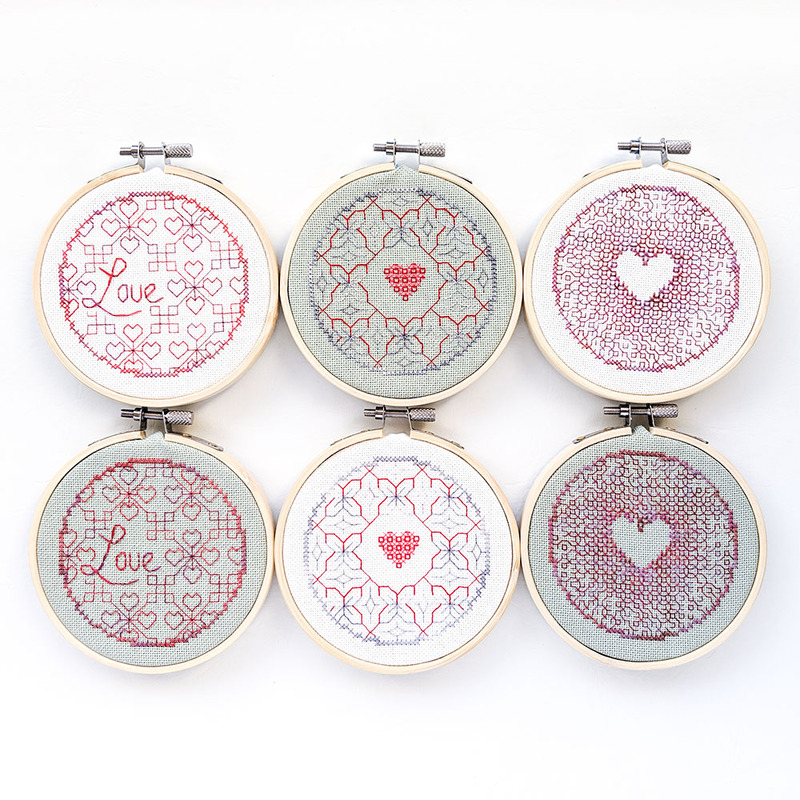 Add a little love to your decor or stitch up a pretty gift with the Blackwork Love pattern. This pattern is also available in a set, the Blackwork of the Heart pattern set.